Our friends Rachel and Brandon suggested Elephant & Castle Elephant & Castle (not related to the chain called Elephant & Castle) for brunch. We met there surprised to see it packed wall to wall, with a wait even when we left (around 3pm). The menu is simple American with a few foreign touches here and there. Nothing too exciting, but not so ordinary that you’d think it boring. The Eggs ‘N Apples Benedict on French Toast sounded most interesting, a way to get a bit of both, savory and sweet. It solves the most common brunch dilemma, a salty protein rich meal or a carb-heavy dessert disguised as breakfast. I requested the maple syrup on the side, so mine was not so sweet, just lightly sweetened by the apples which was enough for me. The thick French Toast was fluffy and buttery, topped with the most perfect of poached eggs. 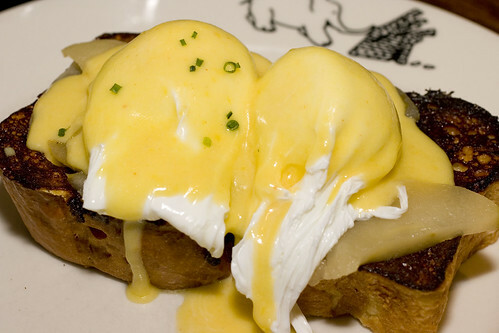 The Hollandaise adds another layer of richness making it decadent, but not sickeningly so. 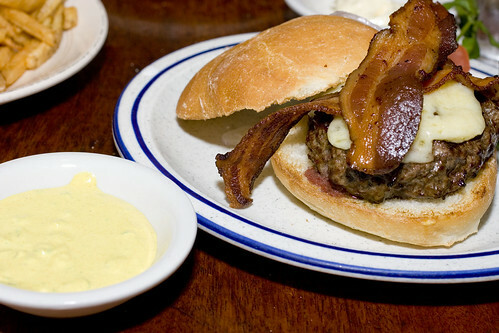 Lon had the Elephant Burger, with bacon and cheddar, curried sour cream with scallions on the side (at his request). It was pretty average and cooked to medium when he ordered medium-rare. 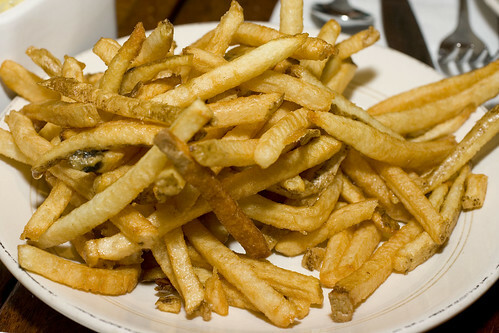 Lon spotted fries, he knew I would like, on our way in so made sure to add them. They were thin and crispy, just my style, but really under-seasoned. A salt shaker remedied that pretty quickly and I ate away. With prices between $9 and $12, this is a solid neighborhood safety spot. But if you don’t live a reasonable walking distance from Elephant & Castle, it’s not really worth the travel. posted by jessica	at 04:12 PM	Filed under American and New American, Breakfast or Brunch, Restaurants. You can follow any responses to this entry through the RSS 2.0 feed. Both comments and pings are currently closed. It sounds delicious to me! jessica – does anyone at restaurants ever stop you to ask why you’re taking photos? or do you get any “special treatment” because they notice your camera? hehe just wondering! When I lived in Philly, they were pretty much always packed because of their happy hour drink specials. Plus, they have pub food, otherwise known as mecca for me. EMC, I saw the website for the chain of Elephant & Castles, which are more pubs with fish and chips. This one is not related though, no bar, different food. The chain does not have a location in NY. the burger looks lovely. I wish I hadn’t seen it before lunch makes it very difficult to face the cauliflower and roti which I have packed for lunch. Eggs benedict on french toast!!!! Wow!!!! It looks really yummie:) Could you fly over to Brussels, belgium & make me this for breakfast??? Holy cow, I never saw the connection! This completely makes sense now–according to the website, the E & C you visited is sister to the Dublin restaurant. We ate there once, and when I moved back to the States, I thought the American E & C chains were really poor imitations of a better restaurant.